Morning comes early on the campus of Concordia University Ann Arbor. Students with both a little experience and a lot of “been there, done that” might have figured out how to schedule their classes to begin later in the day, but everyone within the Concordia community has the same start: a wake-up message filled with hope in Christ through Today’s Prayers. “Good morning, Concordia Cardinals,” hits the inbox of every Concordian each weekday morning under the subject Today’s Prayers from the home office of Campus Pastor Rev. Ryan Peterson. Started in 2013, Today’s Prayers is a daily dose of supplications, thanksgivings, announcements, and encouragement that students and faculty anticipate at the start of each weekday. 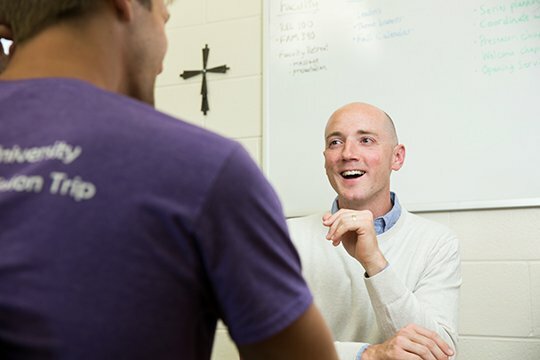 While this written email is an important part of the palpably vibrant and faithfully energized campus vibe, the man behind the prayers, Peterson, brings the Gospel to life every day as a present, energetic, and compassionate leader and role model. His words and his actions inspire students, and help to make CUAA a unique and special place. Often spotted on campus with a messenger bag slung over his shoulder and a Starbucks cup in hand, Peterson makes it his personal mission to engage with students, and “do life” with them in their highs and their lows. Judging by a typical day in the life of the campus pastor, there are no limits to the ways that Peterson extends the truth of God’s grace to students. “Students deserve our best; they deserve our best time and our best energy,” said Peterson. “College is a very formative time, and it’s a gift that we can give to students to be present with them in it. Peterson’s connectedness is evident through the revolving door of his office—students stopping by for counsel, advice, or just to say hello. It’s seen in how he greets students and employees by name as he strolls through campus, and in how he always has a sidewalk companion on jaunts to and from class. Students crave his involvement in their table tennis tournaments, eagerly join him for lunch, and request his encouragement in the locker room for a pre-game prayer. After students graduate, they are sent in fulfillment of the university mission to be servants of Christ in the Church and the world.